Justin Sullivan/Getty ImagesRep. Greg Gianforte of Montana. President Donald Trump on Thursday praised Republican Rep. Greg Gianforte and called him “my guy” for body slamming a journalist in 2017. 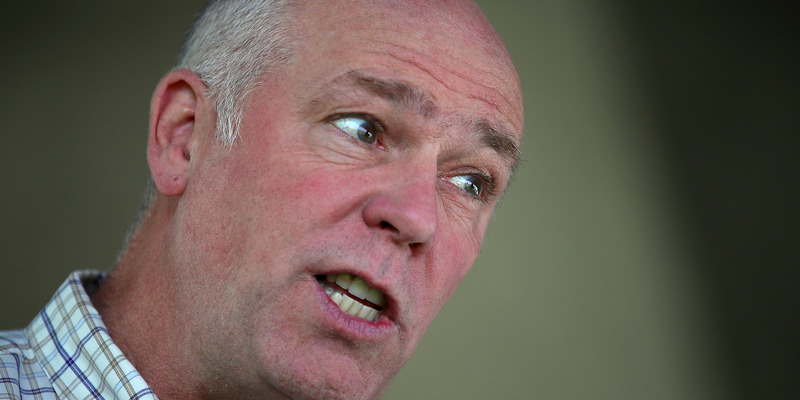 Gianforte was captured on an audio recording physically assaulting Ben Jacobs, a reporter for the Guardian newspaper. “Greg Gianforte just body slammed me and broke my glasses,” Jacobs tweeted shortly after the incident. The encounter did little to hinder Gianforte in the Montana special election that month. He went on to defeat his Democratic opponent. Trump’s remarks come as new evidence supporting the theory that the US-based Washington Post columnist Jamal Khashoggi was brutally killed in a Saudi Consulate in Turkey. President Donald Trump on Thursday praised Republican Rep. Greg Gianforte and called him “my guy” for body-slamming a journalist and breaking his glasses during an incident in 2017. Gianforte was captured on an audio recording physically assaulting Ben Jacobs, a reporter for the Guardian newspaper, in May 2017. “Greg Gianforte just body slammed me and broke my glasses,” Jacobs tweeted shortly after the incident. It happened at Gianforte’s campaign headquarters in Bozeman, Montana, one day before residents headed to the polls for a special election in his district. According to multiple witnesses at the time, Jacobs had asked Gianforte a question on a Congressional Budget Office report on the American Health Care Act before he was slammed to the ground. Trump described Greg as “smart” and warned his audience not to antagonize the Republican lawmaker. “I shouldn’t say … there’s nothing to be embarrassed about,” Trump said to the cheering crowd. Trump also recounted how he initially heard about the incident, and why he believed it to be good news for Gianforte’s campaign as voters headed to the polls. Gianforte pleaded guilty to a misdemeanour assault charge and was sentenced to 40 hours of community service and 20 hours of anger-management, in addition to the $US385 in court fees and fines. The judge called Gianforte’s actions “totally unacceptable” but gave him a six-month deferred sentence. Trump’s comments on Thursday night prompted some criticism, including from Jacobs’ publication. Trump’s remarks on Gianforte’s assault come amid new evidence surrounding the disappearance of the US-based Washington Post columnist Jamal Khashoggi, who is feared to have been brutally killed inside the Saudi Consulate in Istanbul, Turkey. Khashoggi is a Saudi native and legal US resident who lived in Virginia. Khashoggi, an outspoken critic of Saudi Arabia and its leader, Crown Prince Mohammed bin Salman, reportedly feared that his native county would retaliate against him. Saudi officials have denied his disappearance was a result of foul-play on their part.